Confederate pride Facebook group hijacked, Michelle Obama and multi-racial marriage celebrated instead. A new identity for supporters of Confederate pride. 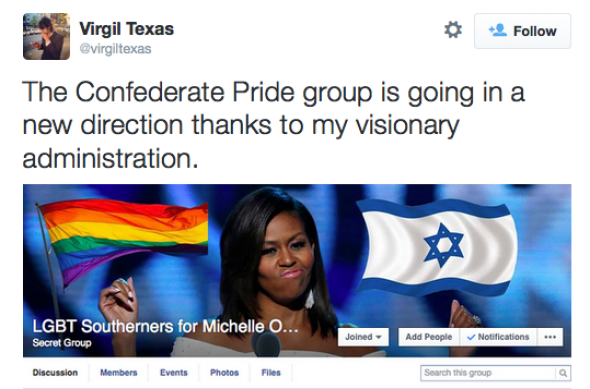 Then he changed the Confederate pride group into the “LGBT Southerners for Michelle Obama and Judaism” group. Original members were not amused. Mr. Texas reports that he’s been kicked out of the group, but not quickly enough to prevent him from adding 50 other pranksters, who are also wreaking havoc, as administrators. Somebody also changed the Facebook URL to /groups/JewsForObamaAndHillary/, which can't be changed back for at least 6 months. Reading his entire recent Twitter timeline is highly recommended.